I have long been forcing myself to write about Artem … I couldn’t find the words [to do it].You could teach anatomy just by looking at his arm. Muscles and bones–all are visible. Tyomka [nickname for Artem] from Berdychiv. 24 [years old]. He is from the 95th Brigade. On July 19, their APC was ambushed under Lysychansk. Artem sustained terrible shrapnel wounds, even [got] shrapnel in his eyes. I tried to rewrite his epicrisis [case history], but at the end of my scribbling I just wrote–torn up. 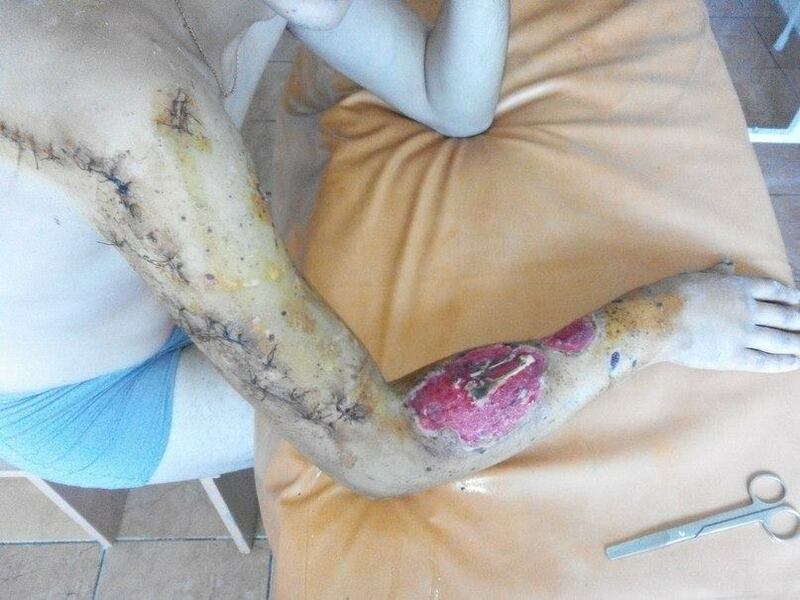 Doctors in Vinnytsia have already performed a huge number of skin grafts. Tyomka is already smiling and goes for a walk, but only God knows what torments he went through and if he is still suffering any pain. He will have quite a long-term rehabilitation. Money is needed … Today, he refused to give a television interview, although I asked him to do it. He is shy and just doesn’t realize what a hero he is! I’d really like to give him the opportunity to understand it. To show him that our people are proud of him! My friends, and those who aren’t friends as well, let’s give up some very important things to us and help Artem! Privatbank Card#: 4149 4978 0332 6315 Vyshemirskiy Artem Mykolayovych. 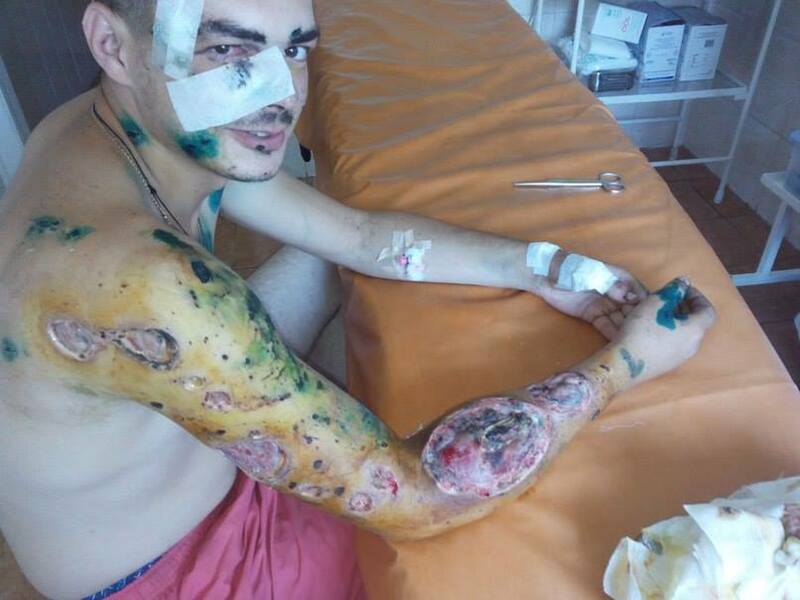 This entry was posted in English, English News, Eyewitness stories, Help for Ukraine, Help for ukrainian wounded, Pictures, South&Eastern Ukraine, War in Donbas and tagged #RussiaInvadesUkraine, #SaveUkraine, #StopWar, ATO, Heroes, Ukraine. Bookmark the permalink. We want to help him…I am Polish and MY HUSBAND IS FROM LVOV. Please let us know how we can get in touch. When you do so, please let us know, and we will tell the author of the original article, Ksenia Podalko, about it and she can look for the money and know where it came from. Thank you for your interest. We are just checking into international possibilities with the author of this post. Will let you know as soon as we hear back!